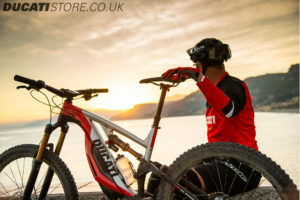 Ducati Store UK are pleased to announce the launch of an exciting new E-bike from Ducati. 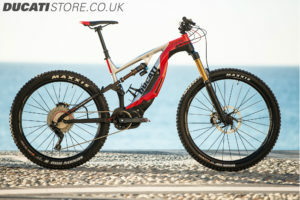 The MIG-RR The official launch will be in Italy on 4th November at Ducati World Premier, but we have some teaser photos and info on the new mountain bike. 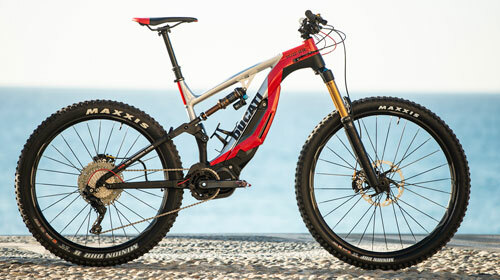 Anyone familiar with the world of mountain bikes will recognize that this is no ordinary e-bike. It has been developed from the Enduro sector of mountain biking. Which is basically to build a bike that can climb any hills, and then descend any terrain as fast as possible. 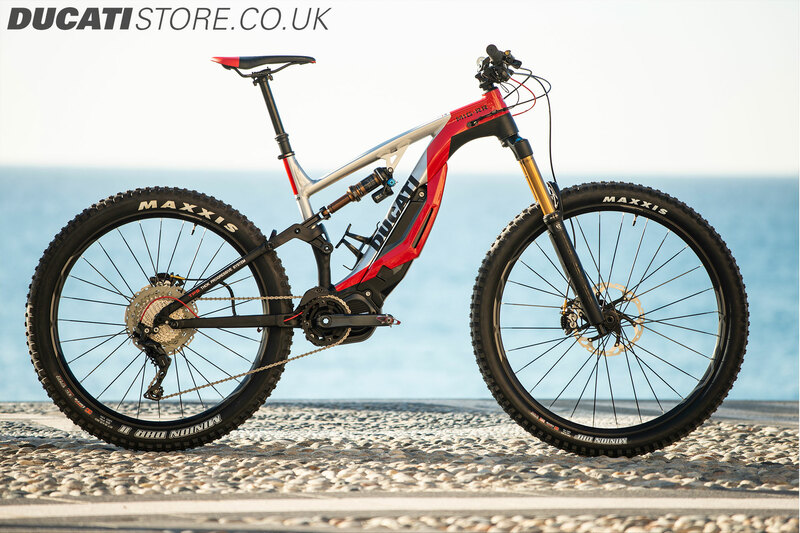 The ultimate all-rounder mountain bike. 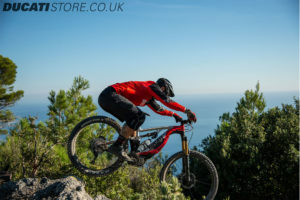 With the addition of the e-motor, this now makes a mountain bike that can go anywhere – you can arrive at the top of the mountain fresh and ready to take on the fun downhill. The MIG-RR uses a 29er front wheel, and a 27.5 rear wheel (often referred to a ‘mixer’). The top end components such as Saint Brakes, Fox suspension, and Shimano XT Gears, will make sure the new MIG-RR can handle any trail you throw at it. We look forward to test riding the new Ducati e-bike when we start staking deliveries in January 2019 onwards. Please contact us today if you would like to reserve one of these new Ducati E-Mountain Bikes. Arriving at our showrooms in Manchester, Stoke, and Preston in Spring 2019. It can also be ordered online at www.ducatistore.co.uk/shop from January 2019 onwards. Borgo Panigale (Bologna, Italy), 1 November 2018 – On Sunday 4 November 2018 the Ducati World Première in Milan (streamed live worldwide on www.ducati.com starting at 19.00) will unveil, in addition to the latest Ducati models for 2019, the new Ducati e-mtb, the MIG-RR, an enduro born out of close collaboration with Italian company Thok Ebikes.